Initially, Stephenie Meyer's novel The Host doesn't seem likely to win the Reliable Narrator Sweepstakes. The main character, Wanderer, believes she's being stalked by ''the Seeker'' — and also hears a voice in her head that she calls Melanie. But put away your psych textbook. Just because Wanderer is paranoid doesn't mean she's not in a sci-fi novel. 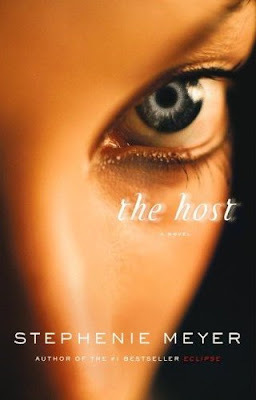 The Host is Meyer's first detour from the love-struck, best-selling teen-vampire novels that have launched a million daydreams and doodles. A race of alien ''souls'' has nested in the brains of most humans and erased their consciousness. But Melanie will not go gently. She convinces Wanderer to trek into the desert, where her true love, Jared, and her brother, Jamie, live with other survivors in underground caverns. When Wanderer tracks them down, she falls for Jared too — which makes Melanie one jealous psyche. As in her Twilight series, Meyer is more interested in relationships than in flashy genre conventions. Will the survivors believe Wanderer when she says that she's joined forces with Melanie's brain — or will they shoot her on sight? The answers are slow in coming, despite the author's well-intentioned ruminations on desire and the kindness of strangers. The Host starts rolling again in its last hundred pages and Meyer's affirmative life lesson is disarming. If only the rest of the book had as much soul. Touch: The first part was quite confusing. You know, sth like you got another voice in your head whose voice is not yours. But I enjoyed the last part very much. It's a happy ending which is not only for now, but something better is going to be.